Butler recognizes students who maintain a 3.75 or higher grade point average. 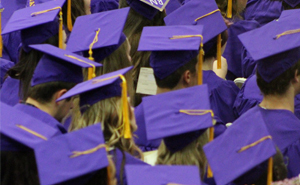 Butler Community College recognized its Order of the Purple graduates, students who maintain a 3.75 or higher grade point average. This honor was established by the college to celebrate outstanding academic achievement by its students. Amongst Butler’s 2016-17 graduates, 166 were inducted into the Order of the Purple. The Order of the Purple was established in spring 1937 to recognize graduates who were exceptional in scholarship, leadership, service and character. Today, to be eligible for this honor, students must have completed 30 hours at Butler and maintain a 3.75 or higher total grade point average. Students inducted into Order of the Purple receive a commemorative medallion to wear at Commencement to symbolize their academic accomplishment. “With tonight’s celebration, you are joining a group of elite top scholars at Butler,” said Kim Krull, Ph.D., Butler Community College President. The college’s Master Teacher, Mark Jarvis, asked the graduates during a lively and interactive speech what their goals are. Allyssa Denke of Derby said she wants to be the dean of a college, while Trevor Hayden of Manhattan desires to choreograph professionally. Specific awards were given to four students. Miranda Kimble of Mullinville received the Huey Award. This award is given to an Order of the Purple student who possesses the same high standards in both academics and extra-curricular activities that alumni Gregory “Huey” Bales, whom the award is named after, possessed. Kimble is also in Butler’s Order of the Gold, an organization that honors students who receive a 4.0 GPA. The Helen Teter Zebold Science Award was given to Mason Buckmaster. Buckmaster of Smith Center plans to attend Wichita State University and major in engineering. Whitney Whittaker, an animal science major from Atascadero, Calif. won the Winnie L. Broers Scholarship of $5,000. She also was named a Livestock Judging All-American. Whittaker plans to attend Kansas State in the fall. The Frank H. Cron History award went to Shelby Martin of Augusta. Martin is in Butler’s Order of the Gold, an organization that honors students who receive a 4.0.